Omega Promotions have provided top quality entertainment to some of the U.K’s and Europe’s biggest blue chip corporate companies. Those companies include Royal Bank of Scotland, British Telecom, Crown Paints, New Look, Kirby International, Sodexo, Sainsbury’s, Hyde’s Brewery, J.W.Lees Brewery, Fleet Accident Repair Group, Sony U.K., Salus Controls, Keltruck, Britannia Rescue and many more. Whether you are holding a full on Expo, business conference, awards ceremony, product launch, company golf day or simply require some form of entertainment for a small gathering or team building day we have it all here for you in one phone call. Speak to one of highly experienced team now, they will help you set everything up, and arrange a meeting with you to talk through tour requirements and budgets. Everything is achievable; we will help you reach your goal to provide a first class event. 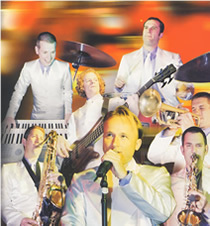 CONNECTION are The Most Exciting Live Entertainment Band in the UK today.